The film is based on Roald Dahl’s book of the same name. James’s happy life at the English seaside is suddenly ended when his parents are killed and he has to go and live with his two horrid aunts. Daringly saving the life of a spider he comes into possession of magic boiled crocodile tongues, after which an enormous peach starts to grow in the garden. Venturing inside he meets not only the spider but also a number of new friends including a ladybug and a centipede who help him with his plan to try and get to New York. 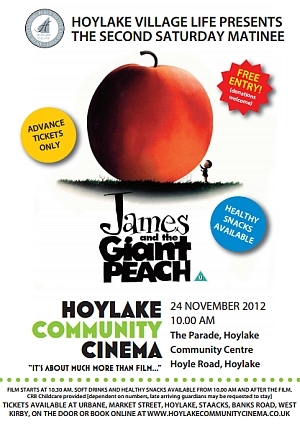 Tickets for James and the Giant Peach are free (childcare included) and are available from Urbane, Market Street, Hoylake; Staacks, Banks Road, West Kirby; The Parade, Hoylake Community Centre; and online at www.hoylakecommunitycinema.co.uk. Children aged 5-14 may be left with CRB-checked childminders, but late arriving parents/carers may be requested to stay, depending on numbers. Early booking is advised.